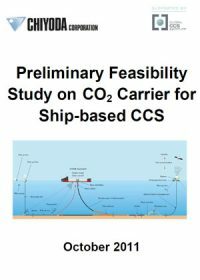 The current study considers the transport of CO2 using shuttle ships. It follows on from an earlier study completed by Chiyoda Corporation. In this study, the CO2 is stored and transported at different conditions and the injection site has been relocated meaning that different ocean conditions need to be considered. The viability of an unmanned injection buoy, instead of a platform, was also considered in this study. The impact of the changes to the CO2 conditions and the injection site on the tank and ship design, the loading and unloading equipment and the flexible riser pipe is studied in this report. An economic evaluation is also completed to assess the cost of CO2 transport for a nominal injection volume of 1 million tonnes per year with the transport distance ranging from 200 to 1,600 km. The shuttle ship’s capacity is approximately 3,000 tonnes CO2 and to reach the nominal injection volume requires a shuttle ship to inject its cargo on a daily basis. This report presents how the storage capacity of CO2 in the offshore area beyond the continental shelf ( i.e.deeper than 200m below sea-level) can be assessed. The “volumetric method” as used for identifying onshore storage capacity was adapted for estimating the capacity in offshore locations. 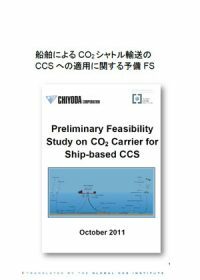 This report from Chiyoda Corporation covers a technical pre-feasibility study of shuttle type CO2 ship transport, the engineering design of ship equipment and injection method suitable for offshore operations, and goes further on to discuss the regulatory considerations for ship-based CO2 transport and injection. 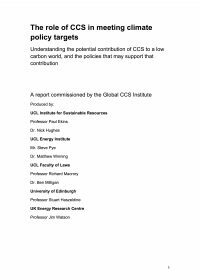 Many regions will be unable to secure suitable onshore CO2 storage and that this will be the major barrier to the deployment of domestic CCS. Shipping CO2 to a suitable offshore site via smaller shuttle tanks could provide an economical alternative to long distance seabed pipeline transportation. The Project Leader for the study is Professor Masahiko Ozaki, who was the lead author on the IPCC Special Report on CCS -Chapter on CO2 Shipping Transportation. 본 보고서는 치요다社의 CO2 수송선 기술 관련 예비 타당성 연구에 대해 다루며, 해양지중 운영에 있어서 선박 설비의 엔지니어링 설계 및 주입 방식, 더 나아가 CO2 수송선 및 주입에 관한 규제와 고려사항에 대해 논의한다. 육상 부지에 대한 CO2 저장의 적합성을 보장하기 어렵다는 점은 일본 내 CCS 보급에 있어서 주요 장벽이 될 것이다. 보다 작은 규모의 셔틀 탱크를 이용하여 CO2를 적합한 해양지중 부지로 선박 수송하는 방식은 장거리 해저 파이프라인 수송에 대한 경제적 대안이 될 수 있다.